During take-off, Katie could see the Robocup 2011 hotel and venue, as well as much of Istanbul. Although we were over the massive wing (another 777, seats 26J and 26K, second row behind the over-wing emergency exit row), Katie could see by craning her neck and looking backwards. Drink service came shortly after we took off. We both had a red wine and an Efes (Turkish beer). A bit later, they brought out warm lemon towels and Turkish Delight snack. Dinner was served (see the menu below) not too much later. We both had the chicken, which was good. After the after-dinner snack of dried Malayta apricots, we both went to sleep. JT sat in the aisle seat, and Katie was able to lay-down and curl up to sleep with her head on JT’s leg. We both slept well, but woke up after only sleeping for 3-5 hours, as it was currently noon in Houston and we needed to try and get our sleep schedule back on track. After sleeping, JT decided to watch Avatar (only partially, as the movie was trimmed so much that he could not follow the plot!) and Inception and Catch Me if You Can and Katie decided to blog and watch Against the Ropes and Into the Wild. We both had sandwiches from the gallery after waking. Katie also had a sour cherry cake, which was excellent. 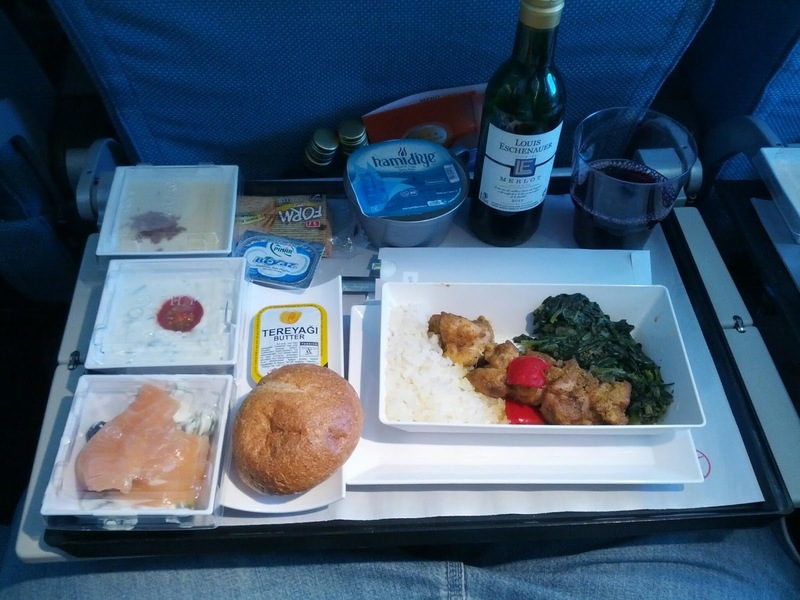 They served dinner a little more than two hours before we landed. 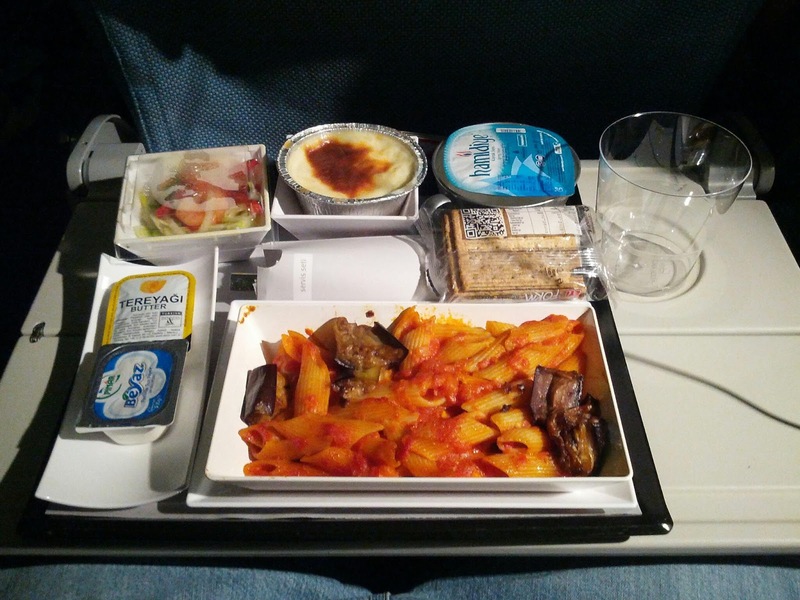 It consisted of shrimp salad, penne pasta, and baked rice pudding. 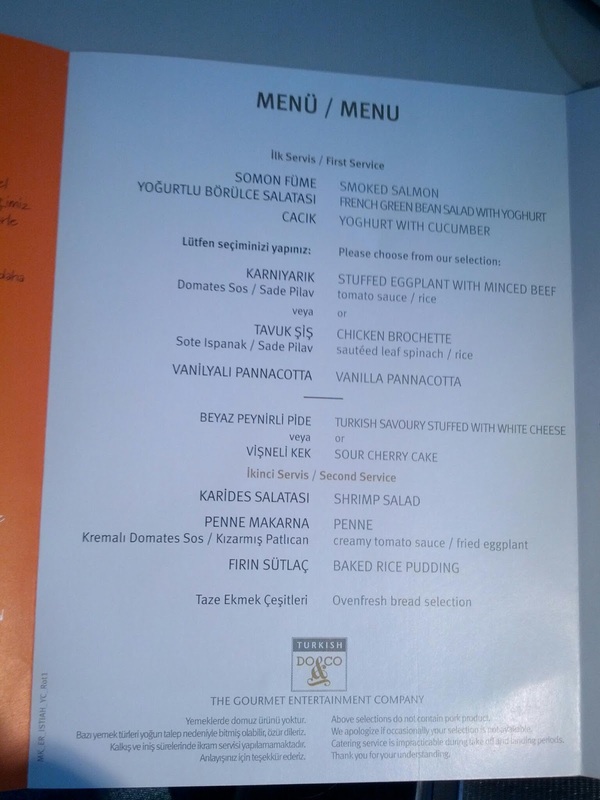 The rice pudding and shrimp salad were particularly good. Upon landing we went through customs, which took a surprisingly long time (the US passport line took longer than the visitor line). 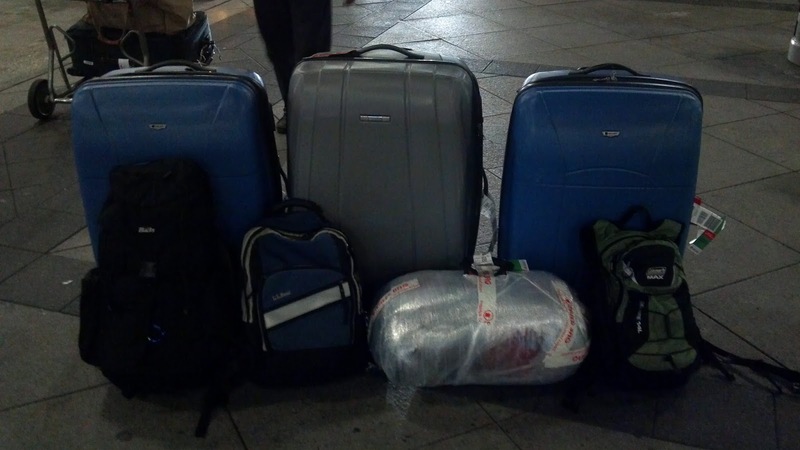 Then we collected the three robot bags and JT’s large backpack (still safely sealed in Dusseldorf wrap). We had to wait a long time for our bags to start coming out, which was pretty concerning. But they all finally arrived, although the robot bags looked a bit worse for the wear. Finally, we went through the final border control point and went outside to wait for Aunt Brenda to come pick us up. Back at Aunt Brenda’s house, we transferred our bags to Jackie, said hi to Elizabeth, and started the 3-hour drive back to Austin. This drive was made significantly more difficulty by our tiredness (it wasvthe middle of the night in Europe – 3 to 6 am) and the wet roads/rainy conditions. We did stop to get Zaxby’s on the way home, as we do not have any Zaxby’s locations in Austin. Our baggage all arrived safely home to Houston. The three large suitcases contain robots, so our personal luggage is just the items in the front row.